In data analysis, the relationship between the mean and the median can be used to determine if a distribution is skewed. The histogram shows that most of the returns are close to the mean, which is 0.000632 (0.0632 percent). The median is −0.0001179. Histogram shows most returns close to the mean. 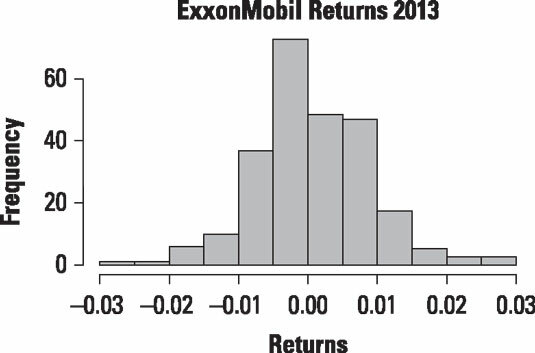 In this case, the distribution of returns to ExxonMobil stock is positively skewed. This means that large positive returns somewhat outweigh large negative returns in this dataset. You can also use a histogram to determine if a dataset is skewed. For positively skewed data, the right tail tends to be longer than the left tail. The reverse is true for negative skewed data. In the histogram, the right tail of the distribution appears to be slightly longer than the left tail, which provides more evidence that the data is positively skewed.